This amateur production of ?Noises Off? is presented by special arrangement with SAMUEL FRENCH, LTD.
One of the most popular comedy plays of all time, Noises Off is the ingenious masterpiece by Michael Frayn which has been performed all over the world and still enjoys hugely successful revivals. The story revolves around the production of a second rate farce called “Nothing On” where we follow the back stage antics of a group of actors as they stumble their way through rehearsals to a hilariously shambolic first night. But Noises Off is a hugely witty and entertaining rip roaring farce with bungled backstage romances, trouser dropping and wayward sardines! Noises Off has often been called the most side splitting play ever written -the perfect way to open this exciting new Garrick season. 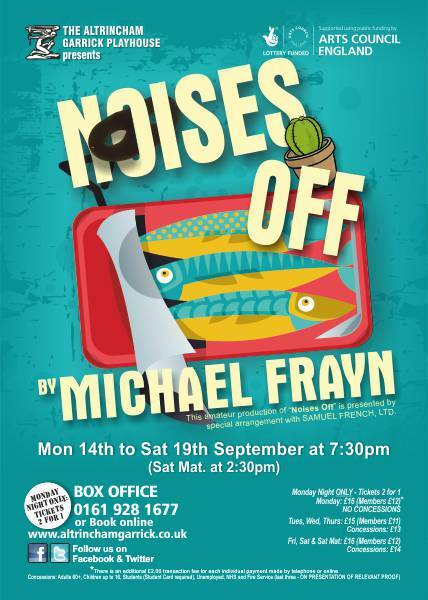 Author: Kevin Proctor ?-?Altrincham Garrick kick off their 2015/16 season with Michael Frayn?s exquisitely imagined and expertly crafted comedy, Noises Off ? the play which undeniably reinvented ?the farce?. ?A number of factors elevate Frayn?s writing of this play above the level of most farces, it?s a piece many adore yet many dread with its complex staging and tricky accounts though this cast, led by director Alan Rothwell, face the challenges and toils of this masterpiece with splendid results. ?As the play progressed, the intricate nature of its writing is exposed further than you could imagine, a challenge (mentally and physically) for any actor. ?This troupe of players evidently worked well together which is highly fortunate given that the success of this piece depends so highly on it. The production could slip so easily into the chaos it apes. Yet, somehow, this talented company makes their own hard work look as effortless as the play-within-the-play is torturous. ?The chaos literally continues to climb we?re unsure where it is going to peak, Jonathan Black?s spectacular staircase tumble in the last act was probably it, after which, we attempt to understand the ?mess? the cast have got themselves into as they painfully endeavour to wrap it up, I was convinced the audience were going to yell/feed the line ?Sardines!? in true pantomime fashion?but the crowd were obviously far too refined for that! ? I sensed that we, the audience, took a while to warm up on this particular performance as it wasn?t until partway through the second act that we all seemed to embrace the production and relish in the fun and I?m glad that we finally did. The slamming doors, smashing windows and disobedient trousers as well as an expanding group of burglars who are a symbol of the pleasure Frayn takes in doubling and trebling his characters' misadventures. ?This production is the finest work of Director Alan Rothwell that I?ve seen. Act 2 (in particular) is choreography which tells its own tale through movement/mime alone. If not fine-tuned, this act could very easily appear to be a self-indulgent and over exhorted mess but the delivery of the physicality executed the proceedings clearly and, ultimately, with the intended humour. I can only imagine the (dare I say) ?fun? that was had in the rehearsal room trying to perfect the timing, all worth the pain! ? ? ?A mention must go to the set which is indeed the tenth player in Noises Off - designed by Margaret Norris, it lived up to its integral role in the book with its traditional and sturdy structure. ?It is the pace of Rothwell?s directing, the nifty acting abilities and copious energy of his company that help to take this farce to another level. It would be somewhat unfair to single out any particular performer as without doubt this is a team effort with no one ?thesp? claiming the limelight. ?The production does justice to the writing's technical intricacy. It is entertaining and painful - a summation of all that farce can offer!